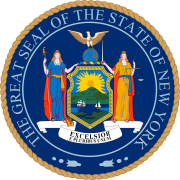 The 1908 United States presidential election in New York took place on November 3, 1908. All 46 contemporary states were part of the 1908 United States presidential election. New York voters chose 39 electors to the Electoral College, which selected the president and vice president. New York was won by the Republican nominees, United States Secretary of War William Howard Taft of Ohio and his running mate Congressman James S. Sherman of New York. Taft and Sherman defeated the Democratic nominees, former Congressman and two-time prior presidential candidate William Jennings Bryan of Nebraska and his running mate Senator John W. Kern of Indiana. Also in the running was the Socialist Party candidate, Eugene V. Debs, who ran with Ben Hanford. Taft carried New York State with 53.11 percent of the vote to Bryan’s 40.74 percent, a victory margin of 12.37 percentage points. Debs finished a distant third, receiving 2.35 percent of the vote in the state. New York weighed in for this election as about 4 percentage points more Republican than the national average. ^ "1908 Presidential Election Results - New York". Dave Leip's U.S. Election Atlas. Retrieved 2013-10-05.